USDA asked for input on Food Crediting on Child Nutrition Programs. The National CACFP Forum made a model comment for individuals and organizations to submit which can be found below. The formal letter that was submitted on behalf of the National CACFP Forum can be found here. Commenting period is closed. I commend USDA for issuing a Request for Information in regard to Food Crediting in Child Nutrition Programs in order to understand possible benefits and any negative impacts associated with potential changes to how certain foods may or may not credit. I agree that it is important that the USDA crediting system balances the nutritional needs of the Child Nutrition Programs’ participants, as recommended by the Dietary Guidelines, and the need to offer flexibility and a wide range of choices. 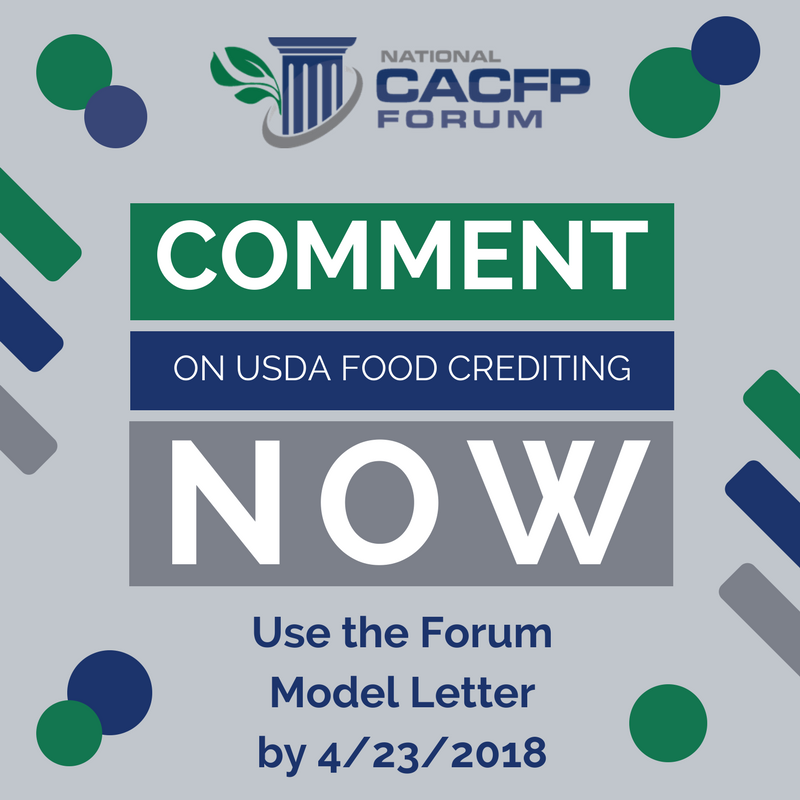 To ensure USDA’s objectives are met, as well as the continued success of CACFP, I offer the following comments in response to USDA’s food crediting questions. Eliminating the Upcoming Transition to Ounce Equivalents for Grains. USDA should not switch to a system of crediting grains, such as bread and cereal, by the ounce. The current system of crediting (e.g. a slice of bread or a cup of cereal) works well for CACFP. Moving to a system of ounce equivalents for grains will unnecessarily complicate the meal pattern, without offering any additional nutrition safeguards to the program. For grains, I do not believe school meal and CACFP crediting need to be the same (Question 1). Retaining the Current Yogurt Crediting Amounts. Establishing a two (2) tiered crediting system for yogurt based on protein content would be complex and confusing while at the same time decreasing the overall nutrient value of the food-based meal pattern. (Questions 15, 16, 17a). Preserving the Food-based Crediting System. Maintain USDA’s current food-based crediting system which allows providers to create a nutritious menu based on a meal pattern without needing to calculate nutrients. The current food-based crediting system already takes into account the full range of nutrients for each food group in the meal pattern. There is no need to start allowing imitation foods or to consider fortification in the crediting of foods. (Question 4). ​Child Nutrition (CN) Labels. USDA should examine options for crediting foods including when a CN label or manufacturer’s statement is not available (Questions 5, 8). Cultural Foods. Address issues around including cultural foods such as Tempeh. I recommend adding more cultural foods to the Food Buying Guide to add clarity on whether or not they are creditable. It is important to continue to consider the customary use of a product. e.g. tortillas and tortillas products should continue to be creditable. When considering customary use it is essential to take into account a wide variety of cultures and diets because CACFP serves such a diverse population (Questions 6, 9, 22, 23). “Other Foods.” Continue to exclude “other foods” of limited nutrition value (section 5) (Question 21). Thank you for giving me the opportunity to respond to USDA’s request for information on Food Crediting in Child Nutrition Programs. I appreciate your consideration of these comments.